There is a huge business build on the fact that people feel the innate need to feel safe and protected. Business security issues are different for each person, because of different types of locations that need to be protected. However, here are some ideas that might help boost the security of different locations and tips that will help you feel safe at work as well as at home. This is a perfect solution for apartment buildings, as well as for offices. The swipe cards systems are safer than people imagine, because they prevent burglars from picking your locks. Moreover, swipe card systems allow users to replace the card upon losing it, which is not the same as making an entire set of keys again. 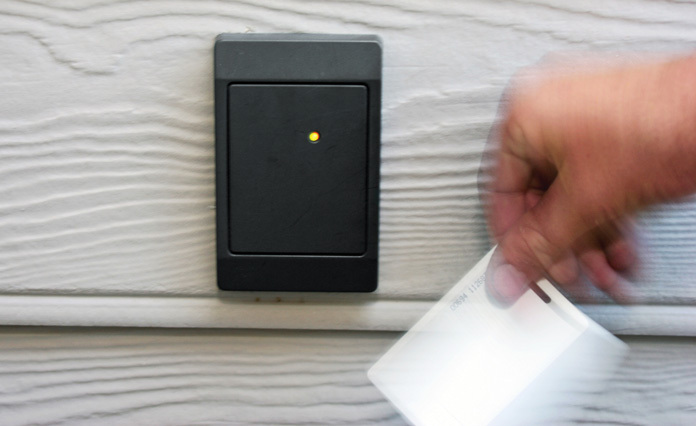 The swipe card systems are generally used in offices, but also in hotels, and as suggested it is great for apartment buildings. The good old doorman could almost never be replaced by a machine. No matter how good or efficient systems are, sometimes people will react differently when there is a man at the front entrance. In addition to that, this is perhaps the most old fashion way of security in a business building or an apartment block, but the one which has definitely stood the test of time. Alarm that automatically contacts the security staff or the authorities in case that anything goes wrong, is definitely what you want to have in the business building, but also in your apartment building block and in your home. This kind of alarms is definitely worth the money and installing it will make your life a lot easier. You will not have to worry about intruders and you will be able to relax in your home and enjoy your life. That being said, the alarm will also react to movements that are seen as a threat, and the really quality ones will disregard a noisy neighbor or a stray cat lurking around your home. This is one security measure that you definitely want to get for any type of facility and the one that will make you feel the safest when you are at home or at work. This investment is also crucial for future owners of the facility, as it will raise the market price for sure.